Animals Digging Under The Fence? Dig Defence Is extending It's Reach! Pets In and Predators Out has been the company slogan for eight years, and it fits because that is exactly why this product was designed, created, and patented. Dig Defence, the Muldrow, Oklahoma based company has hit its stride over the past few months with a new more aggressive leadership team. The creators of multiple below ground animal fence barriers have recently partnered with some of America's top DIY retailers. The CEO of Dig Defence said, "The great thing about our products is they solve very common problems that pet owners deal with everyday. No one wants their pets digging under their fence and escaping. And, no one wants predatory animals digging under their fence to harm their pets. Our products help to stop these problems." Home owners with perimeter fencing, pet owners, avid gardeners, and commercial property owners all have something in common; each property is protected with fencing of some type. The question proposed at the beginning of this article is more about the full potential of the fence being used to protect these properties. Dig Defence is a product to unlock that full potential by extending the protection of any fence underground. Pets In and Predators Out has been the company slogan for eight years, and it fits because that is exactly why this product was designed, created, and patented. Thousands of homeowners, numerous airports and zoos have tried Dig Defence and agree. Consumer testimony and word of mouth has caused the growth of this product. Dig Defence, since its conception, has not relied on conventional marketing but on consumers that have found this solution to be the best option available. Neighbors telling neighbors, animal shelters telling newly adoptive pet owners, airports tired of animals on the runway, this is the “marketing” that has attributed to Dig Defence now being offered by some of the most well known retailers in the United States. Though this method has worked and will continue to be the base of Dig Defence’s growth, this year the company has decided to assist in getting the word out on this solution. Expect a national radio campaign to begin near the beginning of summer and look for signs of Dig Defence to show up in the fencing section of some of these retailers. Thousands of users have decided Dig Defence provides the protection they need for pet and property. The company has heard their cry and will do their best to inform all fence owners to keep Pets In and Predators Out. Dig Defence is now more accessible than ever for those in need, those who want to “stop the dig.” End the fighting with bricks, blocks, logs, concrete, or chicken wire to correct the issue of digging. 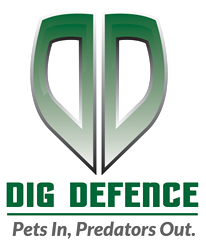 Dig Defence is available online at the following retailers: Lowe’s, Menards, Wayfair and soon to be Tractor Supply Co.